Our next product, Diafragma Caya®, is a new breakthrough in modern hormonal contraception. The new ARGOTIAB ™ product line supports the treatment of hard healing wounds, burns, ulcers, bed sores and diabetic foot. Based on the results of clinical trials, ARGOTIAB ™ medical device accelerates healing, tissue regeneration, and pain relief in people with a difficult to heal wound. ARGOTIAB ™ is safe and can also be used in young children’s diaper rash. 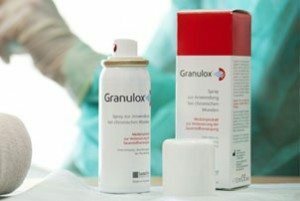 Granulox®is an innovative aerosol providing a natural source of oxygen for the wound. Aerosol contains in its composition hemoglobin to support treatment of difficult to heal wounds and burns. Granulox®is the first in the world to eliminate inadequate oxygen supply (hipoxia) and thus significantly accelerates and shortens the healing time of severe wounds and burns. Granudacyn® – an innovative fluid for rinsing infected wounds.